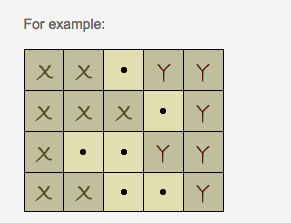 There are two details on a M*N checkered field. The detail X covers several (at least one first cell) cells in each line. The detail Y covers several (at least one last cell) cells. Each cell is either fully covered with a detail or not. The detail Y starts moving left (without any turn) until it bumps into the X detail at least with one cell. Determine by how many cells the detail Y will be moved. Number of test cases is 40.